Crystals are usually octahedral, and they may be very well-formed. Less commonly dodecahedral. Crystals may exhibit interesting combinations of octahedral and dodecahedral faces. Spinel twinning is an occasional habit, and an unusual cubic form is well-known from one specific locality. Crystals may be striated, and some octahedral crystals contain layer growths. Despite our increased understanding of the functions and mechanisms of action of the pineal gland in the past few decades, the precise mechanism at a cellular level whereby electromagnetic radiation can produce biological effects was, until recently, unknown. However in the past decade or so, studies of the ferrous mineral known as magnetite, have shown that it can act as a transducer linking ambient electromagnetic activity to cellular function. In addition – in both animals and humans – magnetite has been identified in most tissues examined, including ALL areas of the brian especially the pineal gland. In recent decades, the ferrous mineral known as magnetite has been identified in most body tissues and particularly in the pineal gland. The magnetite acts as a transducer which links ambient electromagnetic activity to cellular function and is probably how birds and animals circumnavigate the globe so efficiently. Both electromagnetic (EM) and natural geomagnetic radiation of varying strengths and types have been shown to influence melatonin production to the same degree as exposure to light. With the production of melatonin peaking in both June and November when the geomagnetic field is at its lowest. Sunspots, solar winds, celestial cycles and even supernovae have all been linked to fluctuations in melatonin synthesis. The pineal gland can also be stimulated directly using magnetism and changes in geomagnetic and other radiation to the temporal lobe of the brain are known to produce changes in subjective experiences. Our dream states and sleep patterns are also thought to be associated with changes in background geomagnetic radiation. Despite our increased understanding of the functions and mechanisms of action of the pineal gland in the past few decades, the precise mechanism at a cellular level whereby electromagnetic radiation can produce biological effects was, until recently, unknown. However in the past decade or so, studies of the ferrous mineral known as magnetite, have shown that it can act as a transducer linking ambient electromagnetic activity to cellular function. 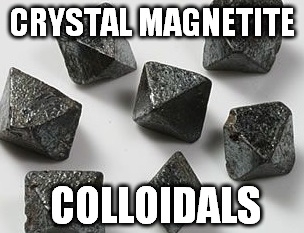 In addition – in both animals and humans – magnetite has been identified in most tissues examined, including the pineal gland (Lohmann & Johnsen, 2000; Schultheiss-Grassi & Dobson, 1999). In traditional Chinese medicine, magnetite is considered salty and cold, and is associated with the Heart, Liver and Kidney meridians. It is a tranquilizing substance, and is used to clear the mind and suppress hyperactivity, producing a calming sensation. It is also believed to improve the functions of the eyes and ears, and has been used to treat conditions such as tinnitus and poor vision. Scientists refer to the pineal gland as the “atrophied third eye.” Indeed, it, along with the pituitary, is the third eye chakra or energy center, but they’re just dormant, not atrophied. According to Max Heindel’s Rosicrucian writings, in the distant past, man was in touch with the inner worlds through an activated pineal and pituitary gland. Considered the most powerful and highest source of ethereal energy available to humans, the third eye has always been important in initiating psychic powers (e.g. clairvoyance and seeing auras). To activate the ‘third eye’ and perceive higher dimensions, the pineal and the pituitary must vibrate in unison, which is achieved through meditation or sungazing. When a correct relationship is established between the personality, operating through the pituitary, and the soul, operating through the pineal, a magnetic field is created. The pineal can generate its own magnetic field because it contains magnetite. This field can interact with the earth’s magnetic field. The solar wind at dawn, charging the earth’s magnetic field, stimulates the pineal gland. This is why the period between 4 and 6 am is the best time to meditate and why sunrise is the best time to sungaze. At these times, the pineal stimulates the pituitary to secrete Human Growth Hormone. That’s why sungazers experience rapid nail and hair growth, restoration of hair color, and general rejuvenation. Cleopatra used to place a magnet on her forehead to stimulate the pituitary to restore her youth and good looks. She didn’t know she already had a magnet in her head. Also at dawn, the negatively charged pineal and the positively charged pituitary combine their essences to create a “light in the head” while meditating. This light has been seen by mystics, initiates, prophets and shamans throughout the ages. They refer to it as the experience of God or of a universal intelligence. Many cultures and mystics have induced this experience through the use of hallucinogenic substances, such as soma, mushrooms, Mescalin, and LSD. However, these experiences tend to be short-lived and require repeated usage to re-live the experience. Most mystics agree that natural methods, such as intense meditation, visualization, deep-breathing, chanting and sungazing combined with purification are the best ways to induce third eye activation and can have life-transforming effects. Among the many metaphysical properties of magnetite, it is perhaps best known as a stone of manifestation. It's magnetite properties attract and capture things, much as if you had tossed out a net and captured the things you wanted or needed in your life. If you are lacking anything in your life, whether it be a material item or an emotional need that has not be filled or is lacking in your life; magnetite can help draw it to you. Many people speak of using magnetite to align the chakras and while it does help to align the chakras, it is more temporary in nature. In most cases, they are actually using lodestone which is much better at chakra alignment. Magnetite is a grounding stone, but instead of just grounding out negativity, it serves as a connection to the energies of the earth and other worlds, allowing an exchange of energies with the negative aspects of the unwanted energies being removed from the body and aura and then being replaced by the positive aspect of the same energy. 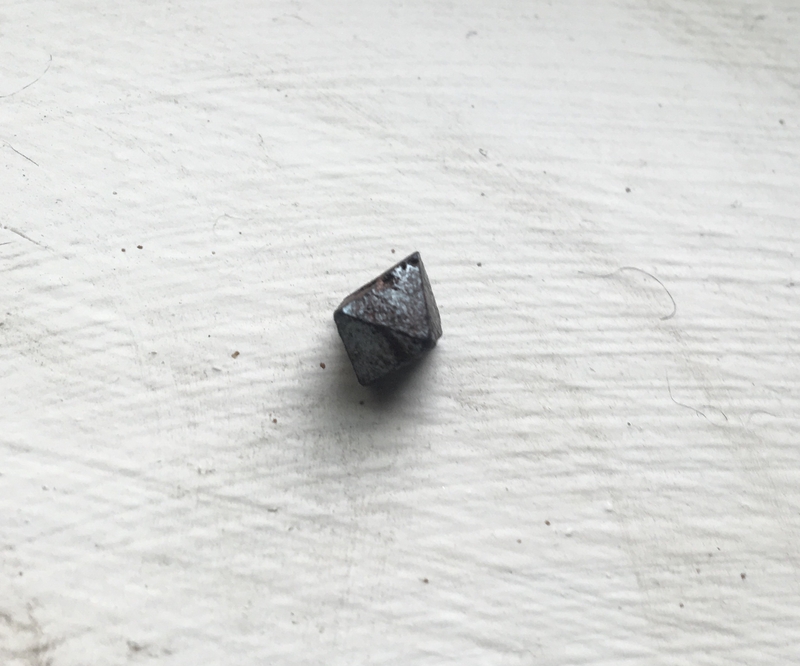 This is somewhat unique in grounding stones, allowing for exchanges such as ridding the body of the stress associated with fear while replacing that negative with the positive of being quick thinking and acting in a fearful situation. Magnetite has been used in amulets and talisman's since ancient times as a strong protection stone. It's connection with the earth provides the wearer with a magnification of their positive aspects needed most when protection is needed, such as enhanced endurance, the tenacity to keep going and the right words and actions to take to help to remove yourself from the unwanted situation. Crystal healers use magnetite for situations and illnesses such as any type of disorder of the blood and or circulatory system. It can help to prevent excess bleeding or bruising and is often taped to the injury site after a fall to help reduce or prevent bruises from forming. In the case of nose bleed, placing a magnetite on each side of the nose has been used to help stop nose bleeds. It has also been used to alleviate pain and boost the immune system. Persons who suffer from any type of nervous system disorder, especially those that result in the nervous extremes such as severe agitation or severe depression, often find relief by spending time with a Megnetite stone. Meditation while holding a magnetite can help one to connect with the universal energies to not just ease what causes the extremes but to also allow one to see how to prevent the situations that caused the original problems. Composition Iron oxide. May contain several different elemental impurities partially replacing both the first and the second iron. Other ID Marks Is ferromagnetic, meaning it is strongly attracted to magnetic fields. Striking Features Strong attraction to magnets, hardness, and streak. Environment Occurs in igneous rock such as diabase, as well as contact and regional metamorphic rocks and in hydrothermal replacement deposits.